Once in Stockholm (on time!) we had a couple more hours left before boarding the plane. 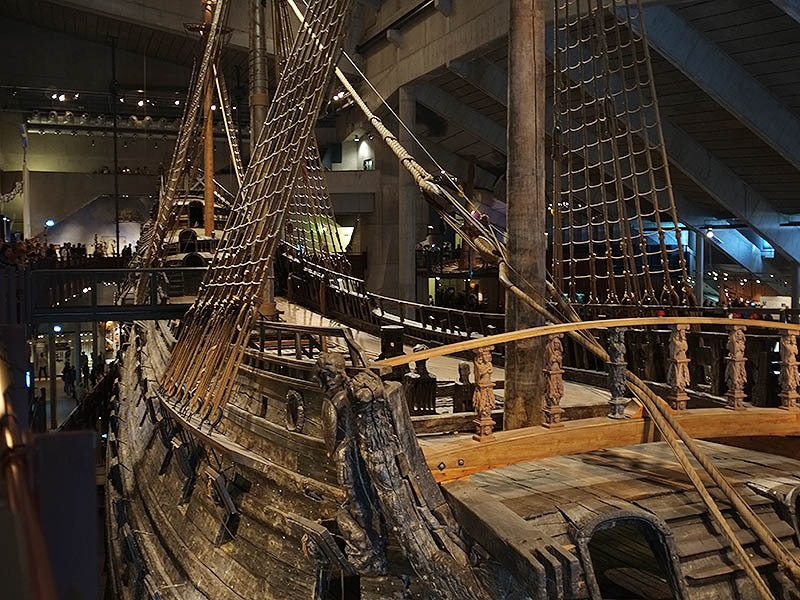 As we have never had so many opportunities to enjoy Stockholm before we decided to do some real touristy things, on the top of the list stood a visit to the Vasa ship museum! 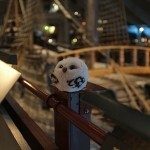 Owlette was amazed at the size of the ship Vasa. Going to the Vasa wasn’t that complicated and we just strolled peacefully along the shore line and past a number of rather beautiful boats, ferries and floating houses. Once at the place though we made a rather bitter discovery: The cruise ship MSC Magnifica (Costa Cruises) was in town and was sending 40 busses to the Vasa museum. Now I know all of you may not believe in Karma or the rule of threes or whatever you wanna call it, but I felt it was a rather appropriate that I, a tourist guide, would end up waiting in line for the longest time while bus after bus of red-necked tourists were engulfed by the gigantic museum. I guess that counts as retribution for all the times I destroyed some peaceful tourist’s vacation by bringing in my backwood mutant tourists in. In any case, yes we did wait quite a bit to get in but once we were inside there were virtually no problems. The museum is Huge! And the ship as well! 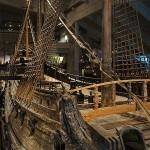 This huge XVIIth century war vessel is actually so gigantic that the uppermost part of the mast sticks out of the museum and four levels of balconies are needed to admire every parts of the ship. There was indeed a crowd while we were there but as I said, there was enough to see so that we managed to have a quite pleasant stay. Special thumbs up to the movie shown in the amphitheater that recreates quite well the Stockholm of the times. In fact, it was impossible to get a good overview of the entire ship without a truly wide-angle lens. 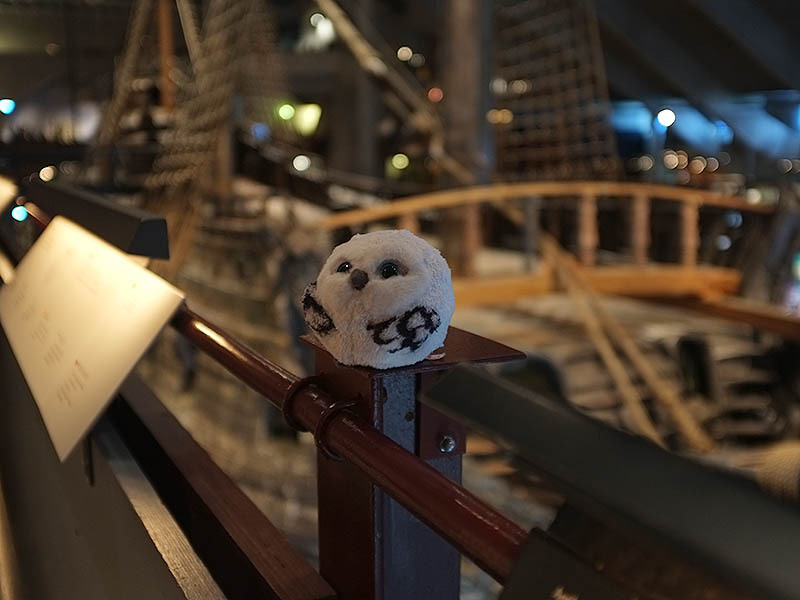 We stayed there for maybe three hours and managed to see just about everything important, outside it was raining but we nevertheless ventured out and, filled with Finnish Sisu we got an organic Ice cream at the stand just in front of the museum and quickly went back to the station. From there on we took the express train to the Airport and even had some free time to spend in the lounge (Silver member power!) where we had access to -gasp- free food! After filling ourselves up to the point of unbearable pain we crawled to our plane that got us to Oslo in no time. Once there, we got refill on food and sat for a couple more hours in yet another plane, bound this time to Reykjavik from which, we planned, we could elope to the New World together. Arriving in Iceland we were met by the surprising and completely unexpected sight of storm and rain. Thankfully, we had not planned on tenting overnight. Instead, I managed to convince my comrade Julian to let us stay at his place for the night. Once we got there, he even indulged in serving us his specialty: fried boloney with pasta! Our night, spent in the kitchen of his student housing was surprisingly cozy (if short) and we managed to sprint to the shuttle bus on time for our next (and final) plane, the dreaded Reykjavik – New-York. On the long flight over the Atlantic Ocean (it was like, 6 hours!) we tried our best not to get too bored. The Icelandair flight had a rather decent in-flight entertainment system and we both watched The Life of PI on our tiny screens. It was a quite nice movie but it only ate about a third of the flight. Our subsequent attempt to entertain ourselves were not successful and only some of the most wretched US Tv series were available on board. After attempting to watch both Glee and New Girl for about three minutes each, I gave up and resumed my reading of Game of Thrones (Vol I so far) with Skalmöld in the earplugs. Gotta give Iceland credit for its microscopic but lively scene.